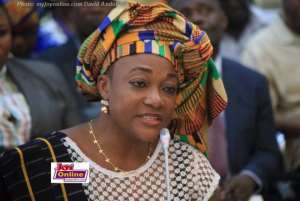 The Minister for Gender, Children and Social Protection, Otiko Afisah Djaba has passionately appealed to Ghanaians to stop stigmatizing and discriminating against Persons with Disabilities to enable them exert their confidence and participate fully in national development. “I urge all parents, siblings, schoolmates, employers, traditional leaders and Ghanaians as a whole not to stigmatize or discriminate against our vulnerable brothers and sisters but to embrace, encourage and support them to develop their potentials and capabilities so that they can lead meaningful lives and contribute their quota to national development”. Speaking at the 2017 International Day of the Persons with Disabilities in Accra, Madam Otiko Afisah Djaba condemned how the Ghanaian society had for far too long mistreated, disrespect the Persons with Disabilities and relegated them to the background. The 2017 celebration was under the theme: “Transforming Ghana through Inclusive and Sustainable Development for All, a journey from the Day of Independence”. The International Day of Persons with Disabilities was proclaimed by the United Nations General Assembly resolution 47/3 in 1992 to promote the rights and well-being of persons with disabilities in all spheres of life, and to increase awareness on the situation of Persons with Disabilities (PWDs). The Gender Minister charged all architects, engineers, contractors, and Ministries, Department, Agencies and the District Assemblies to ensure that buildings, roads, bridges and other developments in the Built-environment are made accessible to all persons in line with the provisions in the Ghana Accessibility Standard in the Built-environment. The Government was determined to empower Persons with disabilities economically, socially and politically so that they can fully participate in the national development efforts. Madam Otiko Djaba also appealed to the Administrator of the Common Fund to speed up the processes involved in releasing the 3% allocation of the District Assembly Common Fund to Persons with Disabilities (PWDs). The District Assembly Common Fund allocation to the PWDs has been in arrears for close to six quarters thereby compounding the plights of the disabled persons. The Minister’s appeal follows a call made on her by the President of the Ghana Federation of the Disabled, Yaw Ofori Debrah at the celebration of the 2017 International Day of Persons with Disabilities to intervene for the release of their share of the common fund. District Assembly Common Fund (DACF) Act 1993, ACT 455, stipulates that at least two per cent allocation be made to Persons with Disability out of the District Assembly Common Fund to reduce poverty among all PWDs particularly those outside the formal sector of employment, and enhance their social image through dignified labour. However, Otiko Djaba assured that the Government and for that matter her outfit, was well positioned to work with all the relevant stakeholders to make life more meaningful and better for the PWDs. The Convention on the Rights of Persons with Disabilities, adopted in 2006, has further advanced the rights and well-being of persons with disabilities in the implementation of the 2030 Agenda for Sustainable Development and other international development frameworks, such as the Sendai Framework for Disaster Risk Reduction, the Charter on Inclusion of Persons with Disabilities in Humanitarian Action and the New Urban Agenda. “The 2030 Agenda pledges to “leave no one behind or out”. Persons with disabilities, as both beneficiaries and agents of change, can fast-track the process towards inclusive and sustainable development and promote resilient society for all”. The National Council on Persons with Disability (NCPD) has collaborated with the Disabled People’s Organizations (DPOs) and other stakeholders to develop draft guidelines on the use of appropriate and accessible forms of communication including different language displays of text, Braille, tactile communications, large print, accessible multimedia, use of sign language interpreters and so on. When finalized, institutions (both public and private) would be required to provide accessible information and services in line with the guidelines. Cabinet approval has been granted for the submission to Parliament of the Marrakesh Treaty to be ratified by Ghana. The treaty seeks to facilitate access to Published Works for Persons Who Are Blind, Visually Impaired, or Otherwise Print Disabled. The Ministry of Gender, Children and Social Protection according to Otiko Djaba, has launched the “#Operation get off the Streets; for a better life” to give meaning life to hawkers, beggars and head potters (Kayayei), through skills training, provision of start-ups and also send those within the school going ages to school. She therefore called on all Ghanaians to support the initiative to succeed.